When Randall Jarrell defined a poet as someone “who manages, in a lifetime of standing out in thunderstorms, to be struck by lightning five or six times,” he could have been describing Darlene Pagán. 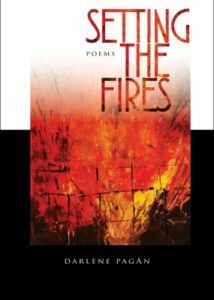 In Setting the Fires, lightning strikes this talented poet dozens of times in poems that sizzle and smolder, delight and engage, surprise and move. For starters, what is so striking about this collection is its structure. Pagán has adeptly arranged her forty-three poems into three sections– “Fuel,” “Heat,” and “Breath” – with fire, both literal and metaphoric, as the unifying image. and another as she turned to walk away. Setting the Fires, then, could easily serve as a model for how to structure a poetry collection, but it’s much more than that. A second and third reading – and this collection will lure readers back again and again – uncover a master poet who peoples her poems with unforgettable characters and imagery that pass the Emily Dickinson test: If I feel physically as if the top of my head were taken off, I know that is poetry. For example, in “St. Anthony’s Bread,” a chance – and initially uncomfortable – encounter on a bus results in a moment of communion between the narrator and a stranger in faded fatigues …/who lumbers down the aisle/with a yellow blanket tucked under his arm/like a baby he’s ransacked from a stroller. I will keep without knowing the terms. The beauty of this lyrical landing is one of the hallmarks of Pagán’s art: her ability to raise the poetry stakes from the concrete details of narrative to the heights of metaphor. In “The Farrier,” one of the most touching and powerful narratives in the collection, a young girl contrasts her father – a blunt-edged shovel of a man. A dry/ spigot of a man – to the farrier: With his full beard/and chocolate gaze, he looked like a lean Grizzly Adams. She observes how her mother curls her hair when this man is scheduled to come, and she listens to the whinnies of laughter emanating from the barn as her mother stroked the horses’ manes and the farrier/cradled one, then another hoof, his voice milky. and gas prices were expected to hit $1.00 a gallon by summer. hard beside us, their shoes would wear out and he’d have to stay. While readers can commiserate with the absent father who is off supporting his family, they also can feel the burning desire for the connection and intimacy that the farrier provides. The narrator leaves us to wonder if Mom running off with the farrier would, indeed, make all the sense in the world. Pagán fills out the pages of Setting the Fires with poems on topics like a failed driver’s test, a visit to a shooting range, knife-throwing lessons, death, the joys and heartbreaks of motherhood. She leaves us with so many memorable, well-crafted poems that readers will be hard-pressed to pick favorites. Lightning strikes every page. After forty years in the academic and business worlds, Carolyn Martin is blissfully retired in Clackamas, OR, where she gardens, writes, and plays. Her poems and book reviews have appeared in journals throughout the US and UK, and her second collection, The Way a Woman Knows, was released by The Poetry Box in 2015 (www.thewayawomanknows).